Image credit & copyright: Goran Strand. On occasion, and if you live in a favorable location, you are given the opportunity to witness one of the greatest natural phenomenon offered to us here on Earth by the universe; the aurora. 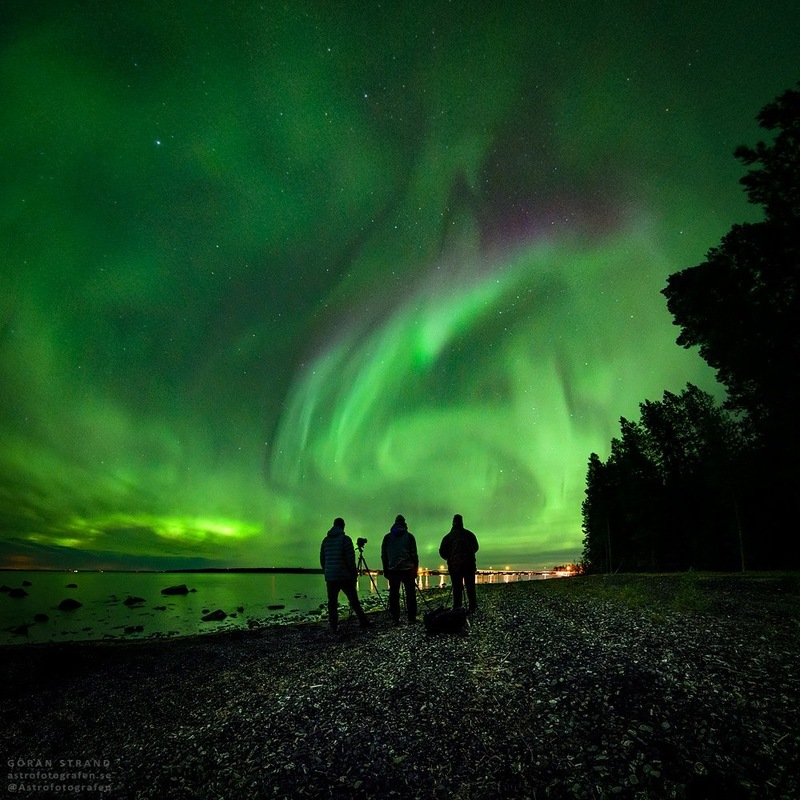 Goran captured this spectacular display last October from Ostersund, Sweden. Like moving artwork painted across the sky, this display is seen leaving its mark, not only in the sky but also reflected on the water. For once, the lights of the nearby population stood no chance at hiding the universe from all onlookers. I hope you enjoy this image and as always please be sure to check out more of Goran’s work. The aurorae, known as the Aurora Borealis or Northern Lights in the Northern Hemisphere and the Aurora Australis or Southern Lights in the Southern Hemisphere are a form of space weather created by our home star. Spaceship Earth is constantly being bombarded with a stream of energized particles known as the solar wind. On occasion, the Sun can also unleash a Coronal Mass Ejection (CME) which is a large shot of material ejected by the Sun in one event. We’re talking about actual material from the Sun and not light so the trip takes about 2 to 3 days to cross the 93 million mile void to Earth vs. the 8 minutes that it takes light to make the same journey. Because of this, we see CME events happen and can predict what their impact energy will be when they arrive a couple days in advance. When the material reaches Earth, it follows Earth’s magnetic field lines and interacts with the atmosphere at the poles. The strength of the event determines how far from the polar-regions that aurorae can be seen. The constant stream of energized particles (solar wind) usually doesn’t produce much of a show unless you’re at a very high latitude while CME events have the potential to put on a show well into the U.S., Europe and up as high as Northern Australia. CME’s also have the power to create havoc with the electrical grid as they can trip breakers and create widespread blackouts if powerful enough. You may have also seen images of aurorae in different colors. Usually green, but sometimes it shows up in multiple colors such as red and or purple. This difference is caused by the charged particles interactions with different chemicals in the different altitudes of the atmosphere. The Sun also has an 11 year heartbeat or “solar cycle” and at the peaks of these cycles the Sun becomes much more active. The solar maximum for solar cycle 24 (the current solar cycle) was extremely weak however. Solar cycle 25 begins in late 2019 with a solar maximum set to begin roughly in the mid-2020s. Cycles 24 and 25 aren’t the number of cycles that the Sun has had of course. It’s just the number of cycles that we’ve been recording since their discovery in 1755. Image | This entry was posted in Astronomical Events, Astronomy (Learning), Astrophotography (Wide Field), Aurora (Borealis & Australis) and tagged Aurora, Aurora Borealis, DanSpace77, Goran Strand, Northern Lights, Science, Solar Wind, Space, Sweden. Bookmark the permalink.